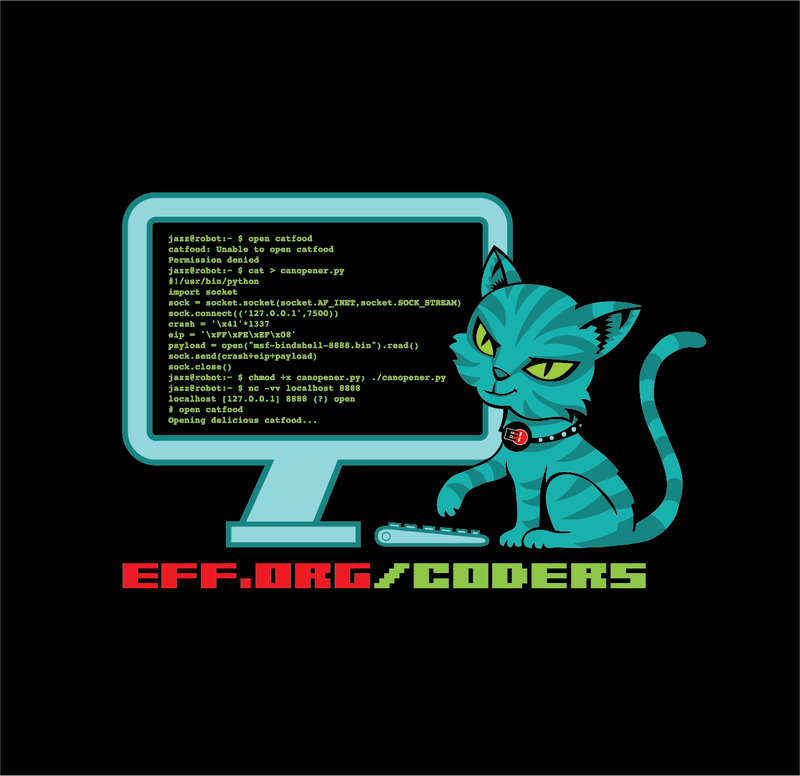 In the ongoing effort to bring you cool things that support important civil liberties issues, EFF is happy to unveil our third annual DEF CON hacker conference t-shirt featuring the dangerous, and yet cuddly Script Kitty. He hacks, he glows, and he demands coders' rights. Our spokeskitten shows that, if you own a killer robot, you have the right to pwn it. The front of the shirt features our EFF-DEF CON logo mashup in a subtle homage to our mutual support (as well as a shout-out to EFF's advocacy for remix culture and fair use). And watch the front and back glow acid green under cover of darkness! In honor of DEF CON's 20th anniversary, we've made this year's special edition member t-shirt available on our site! Get a cottony chunk of hacker history even if you can't make it to Las Vegas this summer. Just join EFF or renew your membership through our D(EFF)CONtest page. Support one of the amazing fundraising teams on the leaderboard, or make an independent donation. While you're at it, start your own D(EFF)CONtest team and be your own first contributor. Compete to protect coders' rights and win a whole lot of 1337 including a stay at the Rio Hotel and Casino, DEF CON Human Badges, Ninja Party badges, passes to theSummit, and more!